I am interested in the history of everyday clothing, and especially in what clothing communicates about the wearer. My background is theatre, not the fashion industry; my experience is with costume design, costume construction, and costume history. Magazines and especially, clothing catalogs, advertisements, movies, and family photos are all primary sources for costume research. Novels and books of etiquette are also useful. Vintage sewing patterns often prompt my memories of the 50s and 60s — and I love to hear and read other people’s memories, too, since regional differences are also important. With the internet, thousands of vintage patterns have become a new source of information, and I am currently undertaking a project that will help to date some patterns that were not dated by their manufacturers. I was inspired by a treasure trove of bound Delineator magazines in my local library. Now that I am retired, I have the time to really examine them — including all those vintage ads and articles that cast some light on women’s lives and work many decades ago. I became a vintage pattern seller almost by accident. When I realized that I have accumulated hundreds of photos of patterns, I decided that the information I collected should not go to waste — it should be shared. I love the conversations that happen in the comments sections of my favorite blogs. I hope some of those conversations will happen here. Fascinating blog, well-researched and thoughtful. My husband is the son of Walter Maya, whose drawing you show in your post of June 27, 2014. My husband would desperately like to get hard copies of his father’s works. Could you tell us where you found this? I have been visiting my (large) public library, which has bound copies of vintage periodicals, especially Delineator (1900 to 1937), Ladies’ Home Journal, and Woman’s Home Companion. I photographed that lovely illustrated ad from Delineator magazine, March 1924, page 99. I love Walter Maya’s style — and I hope he did a whole set of illustrations for Brownatone. I’m afraid I’ve never seen an original, but a search for Brownatone Ads might turn up more Maya illustrations. Good luck. My great uncle is Walter Maya whose drawing you show. I know nothing of his family as Walter’s brother my grandfather died at around age 30. Would you have an email address for karengmpoetry so I could reach out? I have been reading your blog with great interest. I’m a farmer and practical clothes are not being made for someone who is constantly getting dirty and has to run from the fields to the canning kettle. I started to look at some of the photos of my great grandmother’s clothes and had an aha moment. Being only 6 heads tall myself, I have always seen the problem between fashion and reality. I wanted you to take a look at McCalls 8932 see far left photo and LHJ Apron 1917 #1135. Can you tell me does 1135 have pockets? Please keep writing. I’m always disappointed that museums have such few clothes for real people doing real work. That would be easier on the dryer — not a problem in the 1950s, because we didn’t have permanent press clothes or a dryer – just a laundry line. I think a sleeveless wrap dress would be cool and good for canning or jam-making. (I like making marmalade, because I can do that in the winter!) I won’t even buy gym pants without pockets, because I always need a packet of tissues and some hand sanitizer with me! This is where I saw that McCalls Pattern. It doesn’t have side seam pockets, but I’m going to put them in. I get out in the field and I don’t have rubber bands (essential for bundling herbs), if I don’t have pockets. I’m going to do the same button treatment on the top as your 1917 apron. Thank you for your help. I love marmalade, a lovely winter project. It’s the tomatoes that get me. They come on in August and I end up making spaghetti sauce and wilting. I think it’s serendipity that you mentioned overalls. 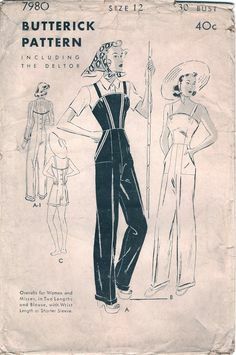 I just saw a pattern for 1940 overalls at http://www.thetailorsapprentice.com/index.php/patterns/category/1940s. I was thinking that if I made them out of linen, with buttons instead of frogs, I could just line dry them and they wouldn’t be too hot in the summer. I have spent hours looking for a wrap dress that is not knit. Knit and farming don’t do well together, I come out looking like a hedgehog. Bean leaves and everything else sticks to knit. Knit also seems very hot in the kitchen. I’m thinking cotton lawn. I guess I’ll keep hitting the pattern books till something pops up. Maybe an afternoon with a stack of old Burda World of Fashions will turn something up. My grandmother was a waitress in Minneapolis until the riots during the depression. Her dress was pink. My grandfather told me that the waitresses wore scandalously short dresses so that they would get bigger tips (he always winked when he told this story). My grandmother always maintained that the dresses were short because her boss was a skinflint, skimping on the amount of fabric allowed for the uniforms. Eventually my grandmother cut that dress to use as quilt pieces, which is the only reason that I know that it was pink! Thank you for the waitress uniform pictures, it helps me imagine what my grandfather thought was scandalous. Thanks for the links. I prefer patch pockets, because they’re easier to make, get into, and hold more! I really enjoyed your comments — I don’t know any farmers except a male cousin by marriage. I’m glad you mentioned linen; for a while I lived in central California — average July temperature 99 degrees — and it didn’t cool off at night. Polyester clothes just made us sweat — even my husband learned to buy 100% cotton clothes. And I can see where you’d need long sleeves outdoors — scratches and sunburn not being good for us. Best of luck with your sewing projects! Hi: Could you write an article about sewing period costumes? The quick answer is, “no.” A great deal depends on what the costume is for, and what the period is. My experience is in theatrical costumes, not reproduction or enactment costumes. It took me years (and a degree) to learn, and I’m still learning. I suggested some of the books I have found useful in past posts about my “costumer’s library” like this one, “Getting Started.” However, The Costume Technician’s Handbook, by Rosemary Ingham and Liz Covey is excellent if you need to refresh your memory (or learn) how to make costumes (covers boning, many stitching techniques, etc.) It even has a website where you can find suppliers and costume societies and book recommendations. You will find a community of people who make wonderful period costumes for themselves to wear at the Greater Bay Area Costumers Guild website — check out their Great Pattern Review (click here) These are people who use purchased patterns to create both realistic and fantasy costumes — then post pictures of the results and a review of how useful or easy-to-use the patterns were. Don’t get discouraged — I started with a couple of reference books and commercial patterns which I modified for a period “look” for school productions. Then I volunteered to sew for a few weeks at a summer theater festival and learned just how much there was to learn. And I loved it! Glad you found it. San Francisco public library had a great display of Chinese Nightclubs in our town — but not enough on menus. It must be interesting to see how Chinese restaurant menus have changed over time, with new Americans bringing new, regional Chinese cuisine. There is even a Uighur pop-up at a neighborhood SF sports bar now! Wish I liked sports bars as much as I like lamb kebobs. What a fascinating blog. So pleased to find someone else who appreciates the significance of everyday wear. We have been collecting hats and headgear for over 50 years. It is only now that I have retired that there is time to research, catalogue, and write about the collection. To see a little of it, go to historyonyourhead.com I shall be following yours with great interest . Frances Dernier. I’m really glad to find your blog! I’m looking forward to reading more about work hats, especially. I am really ignorant about hats, in general, but I take my figurative hat off to you! Hello! I’m interested in all things “Woman’s Institute” and you show one of their 1933 ads in your wonderful article on Letty Lynton sleeves. Do you know what mag you got that from? Thanks and keep up the great work! As I read though old bound copies of Delineator, Ladies Home Journal, and Woman’s Home Companion at the SF public library, I’m accumulating a lot of photos of Woman’s Institute ads. I guess it’s time to share them! The earliest I have is from Delineator, 1917 — I just haven’t explored earlier. (For British readers, The Woman’s Institute was a business, with no relation to the British women’s clubs.) 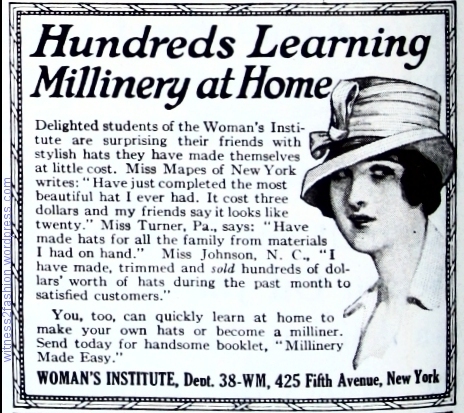 The ads for home sewing courses ran monthly, usually with a new illustration each month. I thought you might enjoy this. My mother recently had 14 rolls of 8mm film digitalized, filmed by my great-grandfather and later my grandfather between 1935 and 1952. There’s a lot of great stuff in there, but this is a tiny, fun detail: apparently my great-grandma wore colourful beach pajamas in her 40’s. This is a very short clip in colour from the late 1930’s, she was born in 1893 and has to be around 45 years old here, with a daughter in her late teens. I always thought that was a garment worn by young women. They lived in Sundsvall, a medium-sized industrial town in Sweden, and they were fairly well off – kind of nouveau riche, I think. This is one of two different pairs of beach pajamas she wears in the 1930’s films. NOTE from Witness2Fashion: Youtube said to be careful about sharing this link, but it is a charming 8 second film of her grandmother gardening in beach pajamas with an “overall” type top. She looks terrific. I’m not a Facebook member, but I love it when people tell their friends about one of my posts. Thank you! I came across your review of “UPLIFT: The Bra in America” a few years ago, and completely agree… this book is an essential resource for anyone who wants to learn / appreciate the profound circumstances how the garment came to become a foundation of fashion that it is today. The authors, experts in their field of study, and their many student volunteers, have produced a reference book that is factual, but not dull & dry. The combination of global factors such as the industrial age, women’s rights, socioeconomic circumstances, textile invention, patent designs and the power of advertising proves that this garment’s history deserves a place in every fashion / costume museum. Since the book was published in 2011, the bra has continued to evolve with computer engineering, social change and soon perhaps… the world of 3D printing. Stay tuned. I love your blog, and often read it with great interest. I have a random question I was hoping you could help me with – Roughly how much did a couture or high end dress cost in the 1930s? Golly! Good question, but I haven’t accidentally come across that information. I’ll keep an eye out for it. Couturiers don’t necessarily charge all customers the same price, so silence was a good policy, and well-brought-up people didn’t brag about how much money they spent, either. 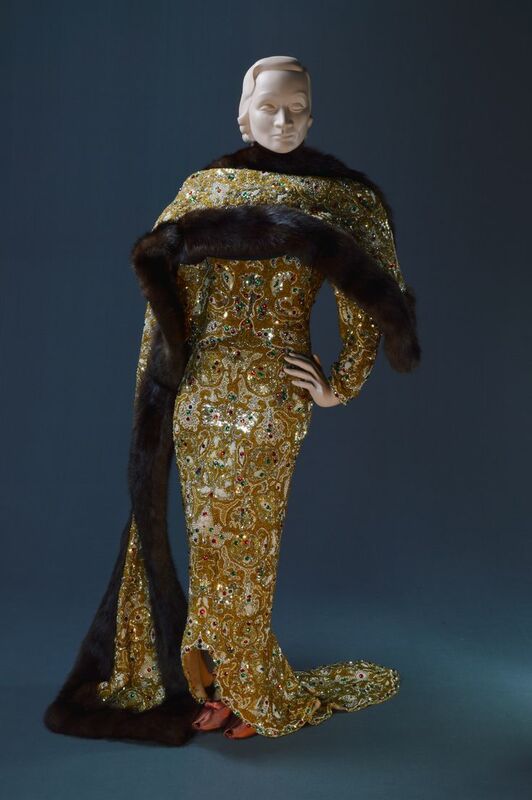 The custom beaded gown designed by Travis Banton and worn by Marlene Dietrich in Angel (1937) supposedly cost $8,000 to make ($135K in 2015 dollars, according to Creating the Illusion.) But movie studios did like to brag about expensive items, for publicity purposes…. Some museum collections with donated dresses have all the paper records associated with the item, which could include purchase receipts. The Texas Fashion Collection has a lot of more recent couture, complete with correspondence between customers and the couturiers. Loved reading about the 20s embroidered peasant dress! I happen to have one and am trying to find an original reference to that style in the 20s/30s. There is nothing in McCall (except some embroidery patterns) Delineator, Sears or Bellas. There are garments for sale online identifying them from that era but nothing in print. I’m on the fashion committee of a national vintage car club and would love to validate that dress as original. What do you suggest? Thanks so much. The comments on that post werer really helpful — Christina mentioned that Paris was full of Russian emigres with embroidery skills after the revolution on 1917, so their work shows up on couture, and Beth identified the embroidery as Norwegian Hardanger — so those may be two leads to finding a vintage photo or source for dating your dress. There must be a museum collection somewhere with provenance…. Good luck! Really enjoyed your point of view, I encountered your discussion of Munby while researching the Aubrey House salon “Pen and Pencil Club” of Mentia and Peter Taylor. Arthur Munby was a member. My topic is Dr. Mary Walker, and her life-long dress reform activism. I had run into Pit Brow Lasses when I started, then surprised to find today that the photos were by Munby. Probably Hannah would have accompanied Arthur in her role as his servant, though the meeting predates their wedding. If it is possible, please don’t share, though your comments would be appreciated if you are so inclined. In addition to Munby: Man of Two Worlds, by Derek Hudson, I enjoyed Diane Atkinson’s Love and Dirt: The Marriage of Arthur Munby and Hannah Cullwick. I don’t think she ever traveled with him until after they were married (and they did consider having her dress in men’s clothes, but decided against it.) I think Munby usually collected photos taken by professionals, rather than taking his own photographs, although he did make sketches. Best wishes for your project on Dr. Walker. I had acquired old boxes of Accounting Journal magazine from the World War I and World War II eras. The ads were quaint and it was interesting to see how different advertising language was back then. You would have enjoyed the illustrations and photos. I gave them away to various individuals and to a local college with an interest in accounting and/or scrapbooking before I visited your web site. Sometimes it’s all about timing. I bought The Great Depression by Studs Terkel but found it difficult to read since there is so much name dropping going on about historical figures (mostly sports related I am guessing) I know next to nothing about. Later they did a photo coffee table book version inspired by his original collection of oral histories. Have you seen it? I understand the expense in time of trying to preserve and share images that might otherwise be lost. Just cataloging and posting the images is very time-consuming. Good luck to you. NOTE: I approved this comment before seeing that I received literally dozens of “likes” all at the same time. Coming from a commercial site, this made me nervous. I would recommend searching for the site rather than clicking any links to it. Thank you as always for your wonderful blog! I have a question and was wondering if you could help me: Did you ever come across sleeved or even longsleeved slips or anything of the like, especially in the 1920s? Wearing dresses or ensembles on the bare skin must have made it necessary to wash them quite frequently, which is fine with e.g. cotton, but not so much with woolens or knits. Apart from that it would add warmth in winter to have a second layer down the arms. I did some research, but the only thing I found were a kind of shortsleeved knitted bodysuits, rather thick, which is not exactly what I thougt would make sense. Do you happen to know anything about it? Long underwear (“long johns” or “union suits”) made in cotton or wool knit was available in the 1920s. Companies that made them include Munsingwear, Carter’s, and Forest Mills. I just found a 1925 ad for Forest Mills underwear showing a close-fitting union suit that stops just above the elbow and just above the knee. There’s a picture of similar long undies in an ad from Carter’s circa 1924. Also, many women wore dress shields which protected their clothing from underarm perspiration. Thanks for reminding me that I have not yet shared the many images I have of practical undergarments — the lacy ones are so pretty, it’s easy to forget the others! P.S. Carter’s made rayon knit underwear, which fit smoothly and closely. 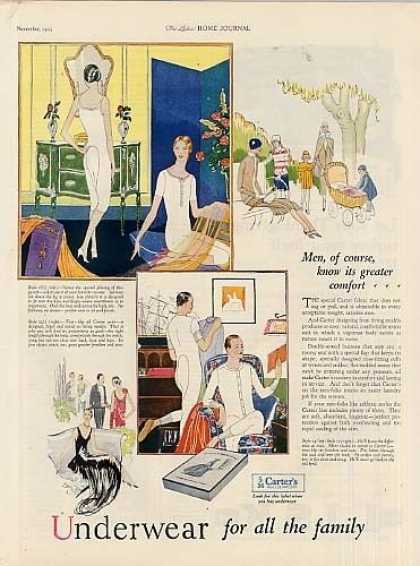 There’s a series of ads showing Carter’s close-fitting, rayon knit, almost knee length undies endorsed by great French designers, like Poiret and Lanvin. But all of those I have seen are sleeveless. I need to do a post about them. Thank you very much! I think these union suits are what I had encountered, too. In the ad above they really don’t look too bulky, but very wearable. Maybe I should take my weirdnes in clothing another step further and make me some of those, ha! More pictures of practical underwear would be great!! Again: Thank you, and have a nice day! What a nice blog! I came across your web-site while trying to understand where possibly could be made a photo of my grand-grand-mother about whom I have no documents except a couple of photographs. Their clothes seem to me quite common for 1900-1910s across the Western world so I have no clue so far which particular country that could be. I am looking for somebody who is familiar with history of fashion. And I wanted to ask whether you could look at a photo and may be you will have hints about these costumes…This is an unknown history of my family that I am trying to recover and I would just very appreciate some help from people who have more knowledge than I do. If you think you could have a look, please contact me via e-mail!